Skate where the pros skate at Boston's state-of-the-art ice skating and hockey destination. 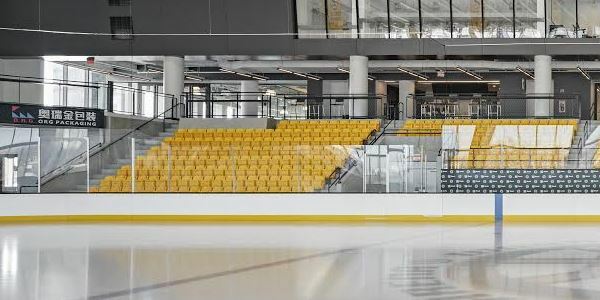 The new training and practice facility for the NHL's Boston Bruins, Warrior Ice Arena offers public ice skating and hockey, as well as college, high school, youth and league hockey with seating for 500 spectators. Warrior Ice Arena offers skate rental, skating and hockey lessons, clinics with the pros, adult hockey leagues, and concessions with healthy food. The arena is the perfect destination for birthday parties, team building events and group skating. Where can I find Warrior Ice Arena Parking? Warrior Ice Arena has a parking garage at the rear of the facility, accessed via the Service Road parallel with the Massachusetts Turnpike. Parking fees are based on the event and time spent in the garage. Tickets can be validated at the 24/7 self-validator at the Skate Rental Desk on Level 2. Validation is good for 3 hours. Garage parking is limited on a first come first serve basis. View parking map here. Does the arena offer public skating and hockey? Yes. The arena offers public skating and hockey on Saturday and Sunday, 12:00 - 1:50 pm. There is also the Friday Rock N' Skate on Friday nights from 8:00 pm - 10:00 pm. Warrior Ice Arena also offers scheduled times for freestyle skating for experiences figure skaters to practice jumps, spins and choreography with their coaches ($15 per session).